Herbs for ear infections will vary depending on whether the infection is an internal ear (otitis media) or external ear infection (otitis externa). External ear infections will often occur if the ear canal becomes wet making the bacteria that are always present, flourish under these conditions. For this type of infection, herbal antiseptic ear drops that also sooth and dry out the ear canal are the principal treatment. Internal ear infections require closer attention as to their cause as this type of infection is often secondary to a bout of tonsillitis, sinus infection or a viral cold. This type of infection is more common in children because the eustachian tube is so short and infection can migrate easily to the middle ear. Internal ear infection can become chronic and it is important to treat it in the first instance. This includes using antibiotics, investigating diet, lifestyle and possible allergens and by boosting the bodies immunity to infection. Ear infections are mostly viral in nature, making conventional antibiotics ineffective but ear infections caused by bacteria do occur. Garlic oil is often considered the first line of defense when it comes to ear infections. Garlic possesses strong antiviral and anti-inflammatory properties which make it a good herbal remedy for ear infection of viral nature. Most air infections that occur in children are caused by viruses making conventional antibiotics useless. Garlic oil is easily obtainable and can be found at almost any health food store. This herb is a powerful antibiotic that is specific to the upper respiratory tract and ears, where it also a well-regarded anti-catarrhal herb. Wild indigo is especially good where there are sinus congestion and infection caused by bacteria and where there are enlarged lymph nodes, as it has the added benefit of working as a decongestant and lymphatic drainer while fighting infection. This herb is considered to be strong herb and has a fairly low dose range; the fluid extract has a maximum dose of 1.2 ml for adults. This popular herb for ear infection is available in a standardized formula known as Echinacin™. Echinacea can be used as a preventative measure to avoid ear infections and has shown to reduce the incidence of cold and flu when taken at therapeutic doses. Herbal remedies for ear infections also need to include herbs that help reduce inflammation and assist in draining catarrh. While Echinacea is an exceptional antibiotic, it is surpassed by wild indigo for ear infections. The flowers of this herb are well-known for their ability to promote healing and their action as an anti-inflammatory, astringent and antiseptic. In addition, recent research has indicated that calendula is useful as a topical antiviral and anesthetic, soothing inflamed tissue as it promotes healing. Calendula is a brilliant upper respiratory tract herb as is not only fights infection but also assists with lymphatic drainage. 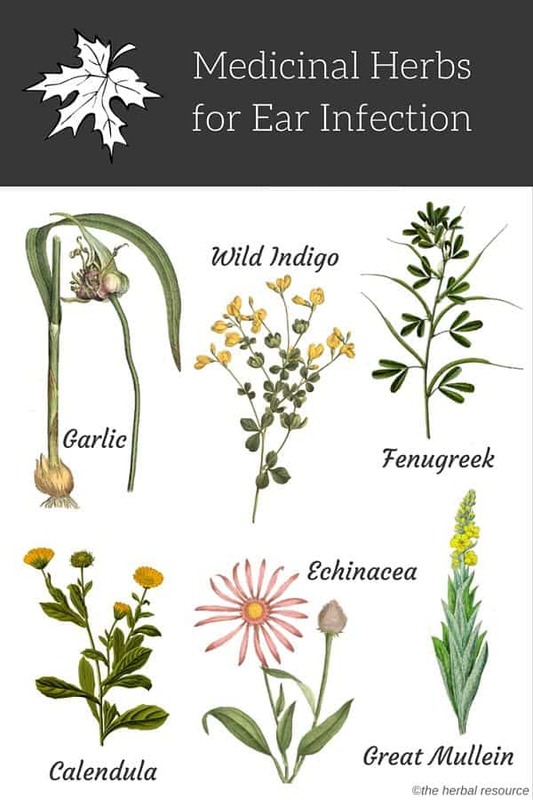 This herb does come with a caution though and should not be used where there is an allergy to plants in the Aster family, such as daisies and chrysanthemums. Like calendula, this herb will help the lymph nodes drain and will assist clearing congestion to ease blocked eustachian tubes. Fenugreek can be used as a tea that will still have beneficial effects in lymph drainage and in fluid extract for more acute cases of ear infection. The leaf of this herb has soothing properties and helps to drain mucus in the ear. Where irritation and inflammation are present such as internal and external ear infections, great mullein helps to calm inflamed tissue and relieve pain associated with an ear infection. In 25ml of distilled water. Dose: Apply with a dropper to the affected ear and gently plug with cotton wool. This can be applied 4-6 hourly. When using herbal remedies for ear infections, other causative factors such as allergies and food sensitivities that could be aggravating the ear infection, including diet, can play an enormous role in avoiding further infections. From a nutritional perspective, vitamin A and C will help reduce the viscidity of the mucous in the ear and assist in draining a blocked eustachian tube. It is also wise to remove wheat, dairy and simple carbohydrates and sugar from the diet, in order to give the body a rest from foods that may be increasing mucus production in the ears and upper respiratory tract. Fresh vegetables, lean meats and lots of fluids will speed up the healing process and decrease the chance of re-infection. Herbs for ear infections help drain the ear, fight infection and boost the immune system, and a supplement that contains the classic infection fighting Vitamins, C and A, plus Zinc will give an added bonus to recovery.